Richard Petty is a former NASCAR driver who raced in the Strictly Stock/Grand National Era and the NASCAR Winston Cup Series. "The King", as he is nicknamed, is most well-known for winning the NASCAR Championship seven times, winning a record 200 races during his career, winning the Daytona 500 a record seven times, and winning a record 27 races. Petty is widely considered one of the greatest NASCAR drivers of all time. He also collected a record number of poles (127) and over 700 top-ten finishes in his 1,185 starts, including 513 consecutive starts from 1971–1989. 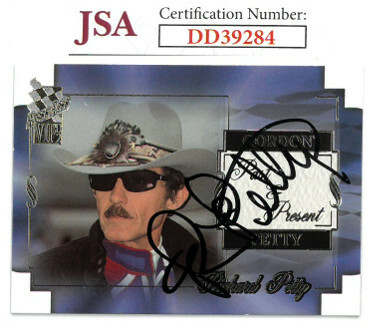 Richard Petty has hand signed this 2002 Press Pass Racing Trading Card #1. JSA Hologram #DD39284 and Certificate of Authenticity.